One of my favorite comments to students is “show your work.” Not in a math way, but the same concepts apply. Journalists are used to showing audiences the final product, completely reported and edited and designed to perfection. Another philosophy — one that I subscribe to and explained succinctly in the popular book by Austin Kleon — is that people want to know what goes on behind the scenes. Look no further than the podcast sensation Serial. The murder story is the draw. But listeners — 5 million plus — also get to peak behind the curtain to see what goes into reporting a story. Serial is very much a podcast about the journalistic process. My message to students: Let people in to see how you are doing what you do. Maybe it’s crowdsourcing or posting an early cut or blogging about the news gathering process. So, in the spirit of practicing what you preach, this semester I will be publishing a behind-the-scenes look at what goes into a multimedia reporting capstone class, which I’m teaching at Towson University. While students are creating their semester-long multimedia projects, I will work on a project of my own that shows the process of being a student reporter and a faculty editor. 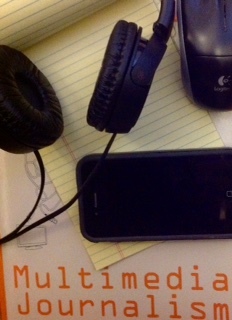 Look for a podcast, videos, slideshows, interactive graphics, a map and, yes, some text as well.